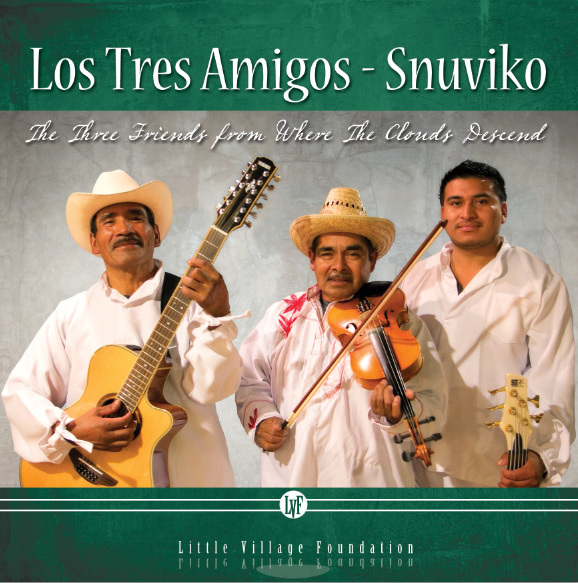 LOS TRES AMIGOES-SNUVIKO/Three Friends from Where the Clouds Descend: This might be pretty wild. Back when the earth was cooling, we used to hitch hike to school. For some reason, a Latino family ‘adopted’ us on our morning trek and, since they stopped or us almost everyday, we saved a load in bus fare. They never wanted any money and never tried anything funny, they just seemed to revel in doing a good deed for some gringos. Who were we to say no? Ok, here’s where the story gets strange. They always had an 8 track hanging out of the deck that they never played when we were in the car with them by a group called Trio Los Amigos and two of these guys look old enough to have been in that group. Maybe? This three piece guitar/fiddle/bass trio are turning in the traditional Mixtec sounds that have been ringing in the mountains and valleys for generations. The kind of vibe here is like the one you would get from a Celt group playing it straight on the traditional tunes. Any gringo worth his multi culti stripes could easily enjoy this at any backyard, summer party. You’d have to try pretty hard to find ethnic music more authentic than this.